Welcome to MedChemComm Issue 4, 2013! This work had recenlty been highlighted on our blogs – why not read the full post here! Also in this issue, read the review article on Metabolism-guided drug design by Amit S. Kalgutkar et al. at Pfizer Worldwide Research and Development, and much more! 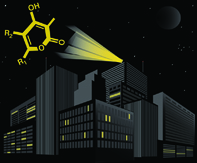 Welcome to this blog taking a look between the covers of this month’s issue of MedChemComm. This impressive image featuring on the front cover of the issue highlights the work being done by Kyong-Tai Kim and Sung-Kee Chung et al. Kim, Chung et al. have found a blood–brain barrier permeable derivative of trehalose that can prevent the aggregation of polyQ in transfected cells. This derivative was also found to prolong the lifespan and improve motor functions in a transgenic mouse model. Read the whole article for free for 6 weeks! an editorial from the European Federation for Medicinal Chemistry President Dr Uli Stilz looking at the continued partnership between the EFMC & MedChemComm. Benjamin H. Fraser, K. Barry Sharpless et al. Welcome to the first issue of MedChemComm of 2013. Join us in taking a look at our successes from the last year and in looking forward to another exciting year for the journal by reading our New Year Editorial. Not only is this issue the first of a new year it is also our New Talent themed issue, where we showcase the strength of research being carried out by some of tomorrow’s leaders in the field with 36 high quality articles. This stunning cover (right) highlights the work of Seung Bum Park et al. who have discovered a novel heterobiaryl pyrazolopyridine skeleton as a selective FLT3 inhibitor from phenotype-based viability profiling and hypothesis-driven deconvolution. Stars, stars everywhere, and it’s not just the rising stars featured in this issue that we’re talking about with this cover (left) from Stephen P. Andrews and Benjamin Tehan. Andrews & Tehan review the first example of structure-based drug design with G protein-coupled receptors (GPCRs) thanks to StaR® proteins (stabilised GPCRs), and how this has enabled the identification of a preclinical candidate for the treatment of Parkinson’s disease. Read it all today by visiting our journal home page. Welcome to issue 12 of MedChemComm, the last of 2012. This month we have 10 concise articles and 1 review for you to devour. Is this review from our collection on ‘The space in-between small molecules and biologicals’ by James C. Collins and Keith James. Collins and James present a critical analysis of macrocyclization reactions published over the past three years, and based on this propose a ‘macrocyclization efficiency index, Emac,’ which would allow the community to determine the true efficiency of a macrocyclization reaction. Is this concise article from Masahiro Goto and colleagues who present their investigations into developing a unique, through the skin, protein-delivery system based on a solid-in-oil nanodispersion that utilizes an oil-based vehicle of proteins. Remember both of these articles are free to access for the next 6 weeks! Get your hands on the last issue of 2012 today. Featuring on the front cover of this issue of MedChemComm is the work of Hansjörg Streicher and colleagues who report the strong and selective binding of 2 types of gold nanoparticles, decorated with the oseltamivir (aka TamifluTM) pharmacophore, to wild-type and resistant influenza virus strains. Streicher et al. describe how the particles interact with the virus neuraminidase rather than the hemagglutinin and could serve as a vantage point for novel influenza virus sensors. The inside front cover illustrates work by Ahmed Kamal et al. (CSIR-Indian Institute of Chemical Technology, Hyderabad), who have synthesized a new series of tetrazole based isoxazolines that show promising activity as tubulin polymerization inhibitors that could be developed for the treatment of cancer. The interesting image on the front cover of this month’s issue of MedChemComm is courtesy of Neil Vasdev and colleagues. Vasdev et al. present work which is aimed at developing a PET radiotracer based on a hydroxyquinoline chelator, and evaluates its potential for detecting amyloid plaques via imaging studies in transgenic rodent models. The inside cover highlights the HOT article of Andreea R. Schmitzer and co-workers who report the factors intrinsic to imidazolium salts that are responsible for the salts’ ionophoric activity, allowing them to act as synthetic ion transporters. Download both articles for free for the next 6 weeks. Issue 9 of MedChemComm has arrived….read it today! Doxorubicin (DOX) is a widely adopted chemotherapy treatment for many different varieties of cancer, but its clinical value is limited due to its systemic toxicity. Currently one of the best ways to minimize the dose-related toxic shortcoming of DOX is to encapsulate the drug in various drug-delivery systems. In this paper from Shiqi Peng and co-workers design a novel self-complexation and complexation controlled target drug carrier for DOX delivery. A review from James C. Knight and Frank R. Wuest, from University of Alberta, that aims to provide a comprehensive overview of the application of CXCR4-targeted imaging probes across both nuclear (positron emission tomography/single-photon emission computed tomography) and optical modalities. Issue 8 of MedChemComm has arrived and it’s a Natural Products themed issue that is filled to bursting with: nine reviews elegantly summarising the synthesis, biosynthesis, inhibitory properties and targets, and biological functions of natural products, as well as new bioinformatics methods for their identification; and fourteen concise articles describing some of the newest discoveries in the field of natural products. A big thank you must go to the guest editors Professor Christopher Walsh (Harvard University) & Dr Sylvie Garneau-Tsodikova (University of Michigan) for all their hard work, and to all those who have contributed to this issue for making this issue such a success. Finally, below is a cover suggestion from Amanda J. Hughes et al., which we really liked but which we were unfortunately unable to use on the cover, so we thought we would share it with you here. Get your hands on MedChemComm issue 7 today! This striking cover brings the work of Patrick T. Gunning and co-workers to the forefront of issue 7. In this Concise article Gunning et al. discuss the design and synthesis of a novel class of ditopic coordination complex-based SH2 domain mimetics using de novo rational and computational design. In addition Gunning et al. identify several lead compounds that bind selectively to target phosphopeptides via the same bivalent binding mechanism employed by SH2 domains in a cell. Access this article for FREE for 6 weeks! The front cover of this issue of MedChemComm highlights the work of Philip J. Johnson, Mikhail Y. Berezin and colleagues. As part of the long term goal of developing nerve specific near infrared (NIR) molecular probes capable of non-invasively assessing peripheral nerve damage, in this concise article Berezin et al. present a study on the identification of a NIR dye suitable for such probes, focusing on a novel highly hydrophilic and functionalisable polymethine dye, and its more hydrophobic analogue indocyanine green. View the entire issue here….